Down in the sewers, the liquid metal robot has finished assimilating the homeless man and has now taken on a human-like appearance. Confused and enraged, the robot violently overturns a passing subway train and devours the brains of all those within. Once finished, the robot shouts Baxter’s name to the heavens. Over in Don’s secret lab where Baxter is being held hostage, the villain’s brainwaves suddenly spike upward. Elsewhere in the lab, Don has deduced that the robot is heading for Baxter, though he doesn’t know how he is able to track Baxter’s location. Baxter is certain that the robot will find him and free him sooner or later and cannot be stopped. Don assures him that won’t happen, clips a Triceraton blaster to his belt and heads out to find the robot. Baxter lets out an evil laugh. Don eventually locates the robot and is astonished to see it has taken a humanoid form. He vows to stop it before it can kill any more people. The two battle, but Don is seriously outmatched. He eventually knocks the robot over with a blow from his shell, then lays into it with round after round of blaster fire until the gun’s charge is depleted. This only proves to slow the robot down, as it begins to reconfigure itself. Don concedes that the robot cannot be stopped and retreats. Racing deeper and deeper into the forgotten depths of the sewer, Don eventually comes upon an old steel door and unlocks it. Inside, he sorrowfully admits that he never wanted to use the help of what’s inside, but now has no choice. 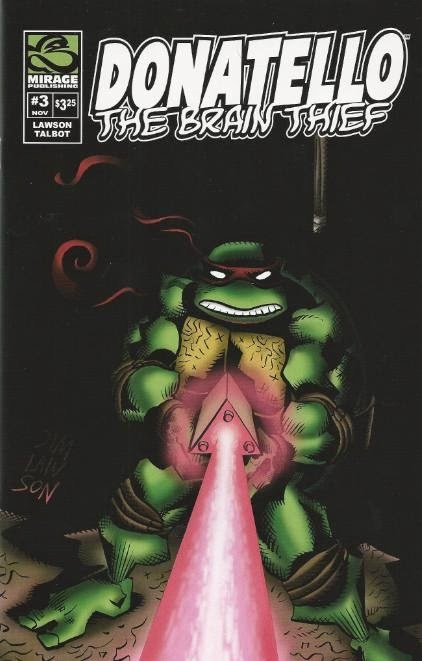 *This issue follows Donatello: The Brain Thief #2. The story concludes in Donatello: The Brain Thief #4. *This is the first Turtles publication following the Viacom buy-out and thus is the first to feature the “Copyright Viacom International Inc. all Rights Reserved” indicia. I think I read this issue in a minute and a half. For $3.25, that’s not much of an investment. I suppose my grievance is that “The Brain Thief” just hasn’t been the story I was expecting. Everyone picking this book up already knows how it has to end. Baxter isn’t going to escape, the robot’s going to be defeated, Don isn’t going to die. 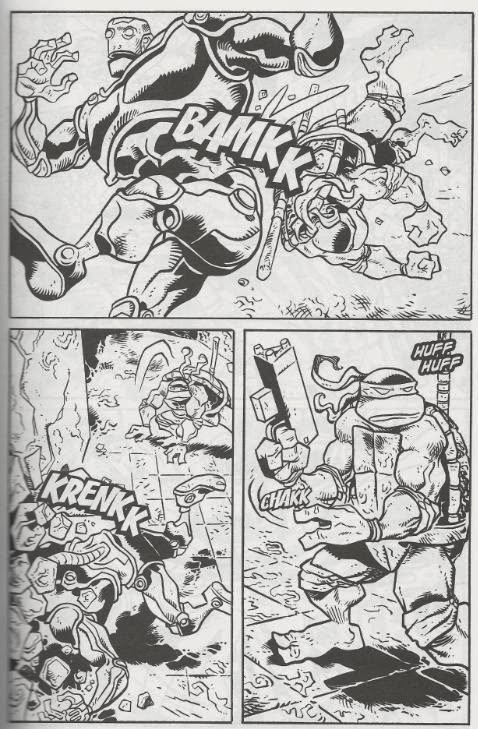 The fact that it’s placed in a small gap in TMNT (Vol. 2)’s chronology guarantees all those things. So whatever drama or tension Lawson is trying to build up with these action sequences only proves to fall flat because, well, we already know how the story is going to end. I came into “The Brain Thief” for something much different than what I’ve been getting. I was hoping for lots of banter between Don and Baxter, exploring both characters, delving into how they’re so alike yet so different. I was hoping for something a tad more…sophisticated. What we’ve been getting for three issues and $9.75 has been an extended battle between Don and a bad rip-off of T-1000. It’s all incredibly straight-forward and, quite frankly, boring. 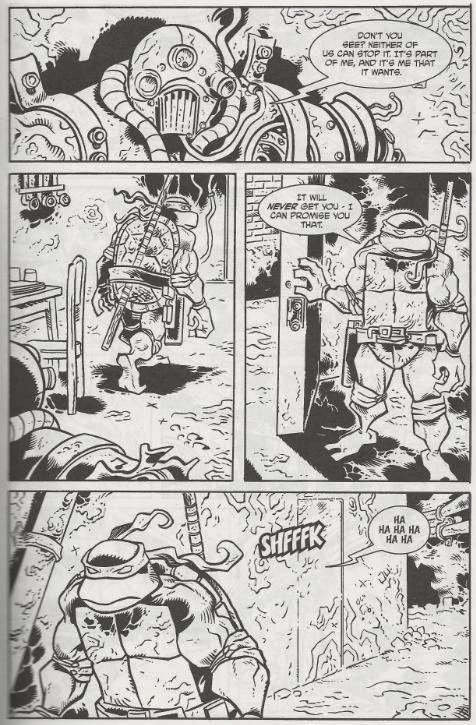 Six pages are dedicated solely to Don running down sewer corridors. The previous issues have included these sorts of pages as well. Just a whole lot of running. It’s very, very dull. “Donatello: The Brain Thief” might have been better titled as “Donatello: The Cardio Workout”. And when you come right down to it, what all actually happened in this issue? Donatello shot the robot with a laser and then ran away. Twenty-eight pages and $3.25 for that? I should’ve just bought a damn sandwich. Would’ve gotten more substance for my $3.25. Anyhow, there’s still one more issue left in the series, but what do you really think is going to happen? Don’s going to pull his deus ex machina out of that closet, defeat the robot and that’s it. Baxter isn’t going anywhere, Don’s gotta rejoin the Turtles so he can complete his Vol. 2 adventures… nothing’s gonna happen.